MELVILLE, N.Y. — (BUSINESS WIRE) — February 23, 2015 — Canon U.S.A. Inc., a leader in digital imaging solutions, today announced that its parent company, Canon Inc., is developing a next-generation semiconductor lithography system employing nanoimprint technology that makes possible sub-20 nm1 high-resolution processes. Within the leading-edge high-resolution patterning segment, where 193 nm multiple patterning has become mainstream and EUV (extreme ultraviolet)2 continues to remain in development, in 2004, Canon began conducting research into nanoimprint technology to achieve sub-20 nm high-resolution processes. Since 2009, targeting the mass production of next-generation semiconductor lithography systems employing nanoimprint technology, Canon Inc. has accelerated joint development efforts with Canon Nanotechnologies, Inc., which joined the Canon Group in April 2014, and a major semiconductor manufacturer. Thanks to such technological advances as the development of defect control technologies and improvements in alignment accuracy, Canon is aiming to commercialize a nanoimprint lithography system in 2015. In nanoimprint lithography, a mold is brought into direct contact with the resist material on the substrate surface, a pattern transfer process that enables the accurate transfer of the mold’s pattern and makes possible higher resolution and more uniform results compared with conventional optical lithographic approaches.3 In addition, unlike optical lithography tools, nanoimprint semiconductor production equipment does not require the use of a light source or high-aperture lens elements, making possible simple configurations and compact designs that enable users to install a cluster of systems for increased productivity. Compared with conventional optical lithography equipment, nanoimprint lithography delivers greatly reduced production costs for semiconductor devices, responding to the high-level demands of semiconductor manufacturers seeking to reduce CoO for high-resolution semiconductor devices. 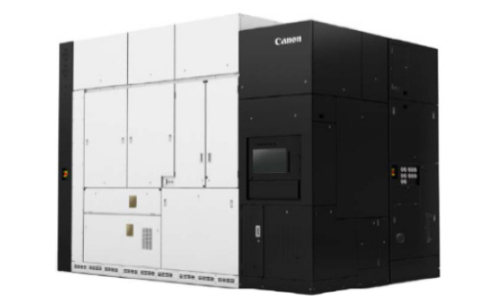 Canon’s nanoimprint semiconductor lithography system currently under development will initially target memory device manufacturers producing flash memory. In the future, the Company will aim to apply this technology in the production of DRAM and logic devices. Canon is planning to present its development progress for the nanoimprint lithography system at the SPIE Advanced Lithography 2015 conference, to be held from February 22 to 26 in San Jose, California, U.S.A.
Canon U.S.A., Inc., is a leading provider of consumer, business-to-business, and industrial digital imaging solutions to the United States and to Latin America and the Caribbean (excluding Mexico) markets. With approximately $31 billion in global revenue, its parent company, Canon Inc. (NYSE: CAJ), ranked third overall in U.S. patents granted in 2014�nbsp; and is one of Fortune Magazine's World’s Most Admired Companies in 2014. In 2014, Canon U.S.A. received the PCMag.com Readers’ Choice Award for Service and Reliability in the digital camera and printer categories for the 11th consecutive year. Canon U.S.A. is committed to the highest level of customer satisfaction and loyalty, providing 100 percent U.S.-based consumer service and support for all of the products it distributes. Canon U.S.A. is dedicated to its Kyosei philosophy of social and environmental responsibility. In 2014, the Canon Americas Headquarters secured LEED® Gold certification, a recognition for the design, construction, operations and maintenance of high-performance green buildings. To keep apprised of the latest news from Canon U.S.A., sign up for the Company's RSS news feed by visiting www.usa.canon.com/rss and follow us on Twitter @CanonUSA. 2 EUV lithography is a next-generation lithography technology that uses an extreme ultraviolet wavelength expected to be 13.5 nm. 3 Semiconductor lithography equipment that employs large-aperture lenses and uses light from a laser to transfer circuit patterns onto a wafer. 4 Necessary equipment investments and operating costs related to semiconductor production. Used as one of the benchmarks for assessing the productivity of processes and production equipment used in a semiconductor manufacturer’s high-volume production line.